Well, judging from the contents of my inbox, I’d say there is plenty going on to make us nervous. We will briefly survey my worry closet today before resuming our series on debt, in which we’ll encounter Paul Krugman’s lament that “Nobody understands debt.” Warning: this letter is going to be long on charts but hopefully shorter on words – perhaps a little heavy on philosophy. At the end I’ll make a few surprise announcements about speakers for our upcoming Strategic Investment Conference in San Diego, April 29 through May 2. You really want to try to join us for what are going to be a fabulous few days. Let’s look a little deeper into the payroll report. You have to like what you see on the surface, as 11.5 million more people are working now than at the February 2010 low. What’s not as rosy is that wages increased by only 0.1%, which is understandable when you realize that 66,000 of the 295,000 new jobs were in leisure and hospitality, with 58,000 of those being in bars and restaurants. (As Joanie McCullough pointed out, full employment now means three fingers of whiskey in the glass, neat.) Transportation and warehousing rose by 19,000, but 12,000 of those were messengers, again not exactly high-paying jobs. 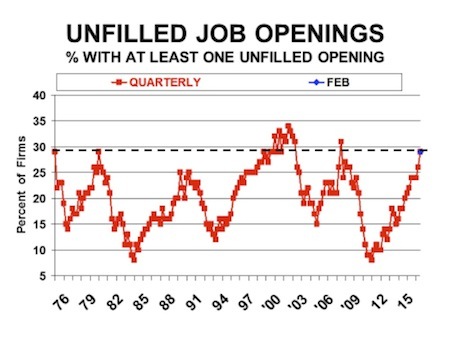 The oil industry is still shedding jobs, though not as fast as many of us thought it would. This employment report was very long on low-paying jobs. Finally, the labor force declined by 178,000 and the Labor Force Participation Rate declined 0.1% to 62.8%. You have to go back a full 36 years to March, 1978, to find a similar rate. Yes, some of the dropoff was Boomers retiring and some of it may have been due to weather, but it is just a reinforcement of the trend that began in 2000. But he makes a point. US S&P 500 corporate profits are forecast to fall by 4.6% in Q1 and by 1.5% in Q2 this year, the first fall in profits for two consecutive Q's in six years, if those forecasts turn out to be true. 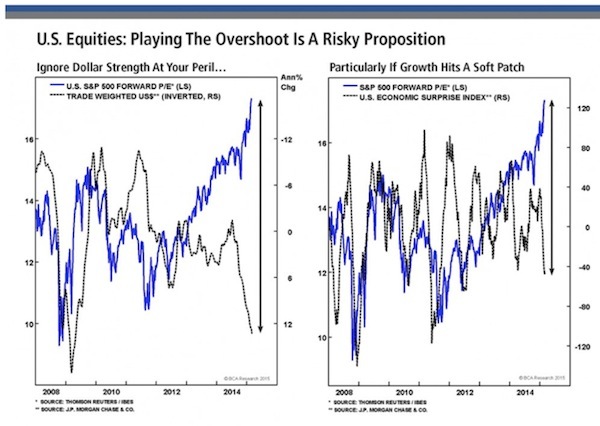 Falling earnings are not the stuff of roaring bull markets. That being said, the NASDAQ of today is not like 2000’s. First, the NASDAQ would have to be at 6900 to give an investor a return in terms of inflation. (It’s oscillating around 4925 now.) Remember the secular bear market in 1966 to ’82? It was actually 1992 before the market reached an inflation-adjusted new high. (Tell me one more time why we think 2% inflation is good. When you lose 20% of your buying power in just 10 years, which span has included two deflationary recessions, the 2% inflation premise begins to look a little suspect.) Second, there is actually an E in the P/E ratio for the NASDAQ. Some of the stocks in the NASDAQ 100 are actually on various investors’ value lists. Even so, valuations are stretched. Doug Short combines four different ways to compute valuations (basically, derivatives of the price-to-earnings ratio) into one average. In the graph below you will note that there was only one previous time (during the tech bubble that popped in 2000) when valuations were higher than they are now. 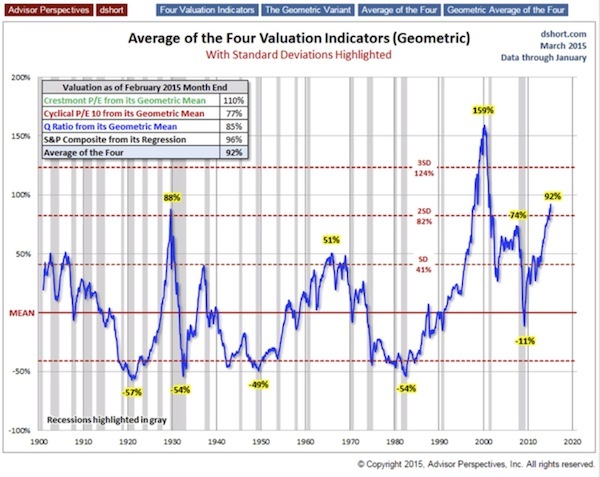 Bear markets and recessions can start from much lower valuations. But then again, my friend Barry Ritholtz argues in his March 7 Washington Post column, that valuations using other metrics are quite reasonable. I am suggesting you have a well-thought-out, calmly reasoned algorithm that will tell you when to enter and exit specific markets. You should already be out of small-caps, as in a long time ago. And energy and emerging markets, etc. Trying to catch absolute tops or bottoms is a fool’s mission, but with a methodical program you can avoid large drops and, just as importantly, latch onto big runs. It takes a well-reasoned system and discipline. You or your advisor should have both. I am excited to announce a few additional attendees to the Strategic Investment Conference. First, Peter Diamandis, physician, engineer, serial (and parallel) entrepreneur, founder and chairman of the X PRIZE Foundation, and an extraordinary visionary (and my friend) will be doing a keynote dinner presentation. Peter is simply mind-expanding. His latest New York Times bestseller, Abundance: The Future Is Better Than You Think, offers a far different vision of the future from the dystopian images that are in vogue today. My good friend George Friedman of Stratfor has cleared his schedule to be able to drop in as well. Then, Richard Yamarone, chief economist for Bloomberg, and Gary Shilling (whom all of my readers already know) have both agreed to come grill our speakers. They will be joined by (in no particular order) Peter Briger of the $66 billion Fortress Investment Group, who will talk on the state of credit in the world; David Rosenberg; Dr. Lacy Hunt; Grant Williams; Raoul Pal; Paul McCulley; David Harding (of the $25 billion Winton fund family); Louis Gave; Jim Bianco; Larry Meyer (former Fed Governor); the irrepressible Jeff Gundlach; the wickedly brilliant Stephanie Pomboy; Ian Bremmer; David Zervos; Michael Pettis (flying in from China); and Kyle Bass, along with Jack Rivkin of Altegris and your humble analyst. Seriously, where is there a better lineup of thinkers, people who can give you the insights you need to navigate these unprecedented economic waters – not to mention that all of them are A+ speakers and communicators. The conference is in San Diego, April 30–May 2, and will once again be at the Hyatt Manchester. For the first time this year, our conference is open to everyone, not just accredited investors. Attendees routinely tell me that this is the best conference anywhere, every year. And most of the speakers hang around to hear what is being said, which means you get to meet them at breaks and dinners. Plus, this year I am arranging for quite a number of writers and analysts to show up, just to be there to talk with you. And I must say that the best part of the conference is mingling with fellow attendees. You will make new friends and be able to share ideas with other investors like yourself. I really hope you can make it. Registration is simple. Use this link. While the conference is not cheap, the largest cost is your time, and I try to make it worth every minute. There are also two private breakfasts where hedge funds will be presenting. Altegris will contact you to let you know the details. This last week has been full of paradoxes. I’ve been on the phone and writing with my friend Patrick Cox on some very exciting developments in the whole anti-aging and life-renewal/regeneration arena. Pat in particular, with some cheerleading help from me, has been involved in midwifing several new technologies into companies and people who can actually take them to completion. When these amazing breakthroughs become available, they will have a significant impact not just on our lifespans but on our healthspans. We will live better as we live longer. It is truly an exciting era we live in. Then Saturday I went with my daughter Tiffani to a surprise birthday party for her high school classmate Scott, who is the son of one of the most remarkable couples I know. Darrell and Phyllis Wayman had six biological children but also adopted 17 special-needs children. Because of my activity in adoption circles (I adopted five children), we became close friends. For the most part, they did not adopt the “easy” kids. Most of them had serious handicaps, problems that would need lifelong special attention. Going to the Wayman’s house was always an adventure, but I always found it full of happiness and love. I never truly understood how they did it. Just thinking about what they did left me exhausted. Tragically, Darrell passed away suddenly in the mid-’90s, and Phyllis joined him in the middle of the last decade. To watch those children rally around each other, even the young ones, and take care of each other and make sure they all stayed together was very inspiring. With all the bad news about the depravity of humanity on TV, knowing this family gives you hope for the human race. You can see the legacy of Phyllis and Darrell in the way these children work together and care for each other, persevering in the midst of what (to merely normal human beings like myself) seem like overwhelming circumstances. Those 23 kids now have 21 grandkids; and once again, walking into their family home, we felt the love and happiness. Scott, at 40, has become quite the young software executive and is getting ready to launch his next venture. I’m not certain I understand it, but if you are ever going to bet on a young man with character, drive, and perseverance, this would be that man. I know some venture capital experts who say that picking the right management team is more important than picking the project. I may just ride along on this one, if for no other reason than to see how it turns out. And, as we were in the area, we dropped by afterwards to see my mother. She has been bedridden for almost two years and has been visibly failing for the last few months. At 97½ years, she has lived a long and amazing life, persevering through many good and some very difficult times, spreading happiness to all who knew her. When we walked into the family home where mother had lived for almost 50 years, we knew as soon as we saw her that the end was quite close. You could see in her eyes that she knew it, too. She did not want to go to the hospital, but my brother did call hospice, who came and offered some care that provided some relief, and she passed away quietly a short while later. Even though this was an event we knew was coming for some time, the finality of death always brings a personal confrontation with your own mortality. The loss of a parent compounds the emotions in complex ways. The juxtaposition of the conversations I was having with Pat on our efforts to postpone our own personal eventuality, the overwhelming joy of those 23 kids who I no longer see as having special needs but rather special lives, and then the cruel finality of my mother’s parting, is a bit overwhelming. We all go through such experiences, and if past performance is somewhat indicative of future results, we endure and go on with our lives. But such times do give us pause for reflection. I want to believe there is a Very Special Place, beyond a mere heaven, where certifiable Saints like Darrell and Phyllis and my Mother are rewarded for a lifetime of caring for others and spreading blessings in the midst of the chaos of normal human life. If I were a god, I would make it so. March 22, 2015, 9:49 p.m.
John—- First, my thoughts have been about you and your family since I first read your letter of March 11. I read your letter regularly because I agree with most of your thoughts. It is reinforcement for my thinking. My mother is 101 years old and living by herself in an apartment. We have caregivers that assist her in the mornings and evenings. She wonders why she is still living. She knows that her mind is now failing. But, her wishes are that she remain in her home instead of a nursing home.I thought that she would not make the change from the home that she had lived in for 59 years to an apartment 7 years ago but she is quite content. She voluntarily quit driving at the age of 99. She has survived because she had open heart surgery at age 80. She has outlived her body and her oldest child. We wait for the time that our generation will be “in charge” of the family. It is a great responsibility. We always question our ability to continue our heritage in a manner that would make our parents proud. You have succeeded. Your mother is very satisfied with you and your siblings. Her work here is finished. She is now a part of God’s memory. March 15, 2015, 6:12 p.m. Very sorry to hear of your mom’s passing, John. I have appreciated how you have interwoven the day to day of your personal life into your financial letters. It keeps them in perspective to what Really matters. Thanks for sharing, and all prayers and thoughts of support to you and your family. March 13, 2015, 3:16 a.m.
John, I lost my mother in 2002 and will never forget her. My deepest sympathy. May peace and comfort find you and your family during this difficult time. Your mother is indeed in a very special place. March 12, 2015, 12:49 a.m.
My condolences to you and your family, John. It must always be hard to lose a loved one. Though I am Jewish and once was Christian, I believe in the ideas of Buddhism and that our souls are reincarnated and progress through a series of stages or levels of attainment. Special souls DO go to a very special place in heaven based on their level of worldly attainment (this world and maybe others). You mother and friends are likely advanced souls who are at a high level of spiritual perfection. It is only logical that our souls should mirror our physical journey through life seeking worldly perfection. March 11, 2015, 7:52 p.m.
John, I am a longtime reader. Just want you to know I am sorry for the loss of your mother. My thoughts are with you and your family during this time of grieving, reflection, and celebration of a life well-lived. March 11, 2015, 7:31 p.m.
John, I am always grateful for the sharing of you wisdom, my deepest sympathy for the loss of your Mother. March 11, 2015, 6:08 p.m.
March 11, 2015, 4:08 p.m. If your generous sharing of your wisdom and experience through your letters is any reflection of the generosity exhibited by your mother, then she was indeed a special person. My sympathies as you and your family face this loss. March 11, 2015, 3:15 p.m.
My condolences, sir. The hardest part of life is to lose the giants that allowed you to stand on their shoulders while you reached for the stars! March 11, 2015, 2:29 p.m. I was saddend to read of your Mom’s passing, John. It will happen to me some day, my Mom is 81. As always, thanks for sharing. Your words and thoughts are that special place where all loved ones live on.